PRODUCT: 10" SUPER SEAM WELD PROBE. PRICE/EACH. DESCRIPTION: Handy probe for testing welded roof material seam and other plastics welding seams. Attaches to handle for stand-up use. INSIDE THREADED HANDLE FOR POLES. 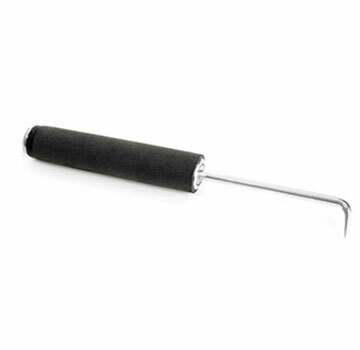 APPLICATION: Probe has a heat-treated hardended tip and the handle is tapped to fit standard threaded extension handles allowing the tool to be used from the standing position. 1. Place the point of the seam probe on the edge of the heat welded splice at the step off and apply medium pressure while pulling it length wise along the splice (position the probe point parallel to the surface of the sheet. Use caution to avoid scoring the membrane surface with the point). 2. Mark any areas where the point of the probe penetrated the splice indicating a cold weld. 3. Make the necessary repairs to the cold weld per roofing membrane specifications and repeat the process to the heat welded repairs.